This article comes by way of reader submission by Dave Cox - avid motorcyclist, and resident of Nova Scotia. He rides a Suzuki 800 Volusia; and ride he does, based on this map he has submitted. Dave clearly took some time on and off the motorcycle preparing this map. 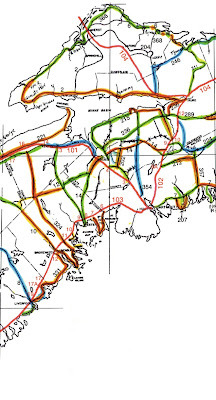 On the map he ranks many routes across the mainland portion of Nova Scotia (excludes Cape Breton). If you look closely you can see that many of the exit numbers on the 100 series highways are included. Dave has graciously provided us with a copy of his hand drawn map so we thought we'd share it with you as a resource you can use to help plan your next Nova Scotia adventure. If you're visiting the province this may greatly assist you in planning some interesting rides and avoiding some potentially disappointing ones. The home base of Canadian Motorcycle Rider is Nova Scotia so I know I'll be referring to this map and checking out some of these routes this summer. 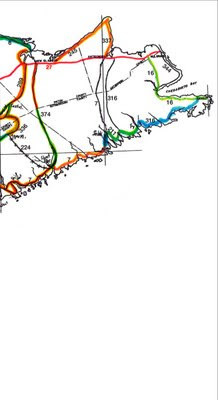 In addition to the map itself, Dave mentions that a seemingly often overlooked gem of the mainland is the 245 and 337 that take you around Cape George between New Glasgow and Antigonish. He likens it to a mini-Cabot Trail and that it's probably THE best ride on the mainland. High praise - Might just have to make that one a priority! Another special thanks for this submission from Dave goes to Motorcycle Mojo to whom Dave first submitted the map to. Thanks Motorcycle Mojo for also allowing us to publish the map and share it with riders. Note: The map is large, so rather than post a small single image of it we've broken it down into three pieces that you can enlarge, print, and piece together to have as a reference. Piece them together starting with piece 1, then 2, and finally with 3. Cabot Trail Motorcycle Retreat - A motorcycle retreat nestled on 100 acres of wooded land in Middle River, Nova Scotia. They've got three guest rooms and are a great spot to stop when exploring the Cabot Trail. CanadianMotorcycleRider readers receive a 15% discount off already reasonable rates. Be sure to mention us when booking! Motorcycle Tour Guide Nova Scotia - A free tour guide book of Nova Scotia geared specifically towards motorcyclists. A great companion to any motorcycle trip to Nova Scotia. NS Department of Transportation and Infrastructure Renewal WebCams - the highway camera site of the Nova Scotia Department of Transportation and Infrastructure Renewal. This site allows motorists to check out road and weather conditions on the Department's highway cameras during daylight hours. These cameras are located next to the highway at specific locations across the province. NS Tourism Guide - Nova Scotia's official tourism website.